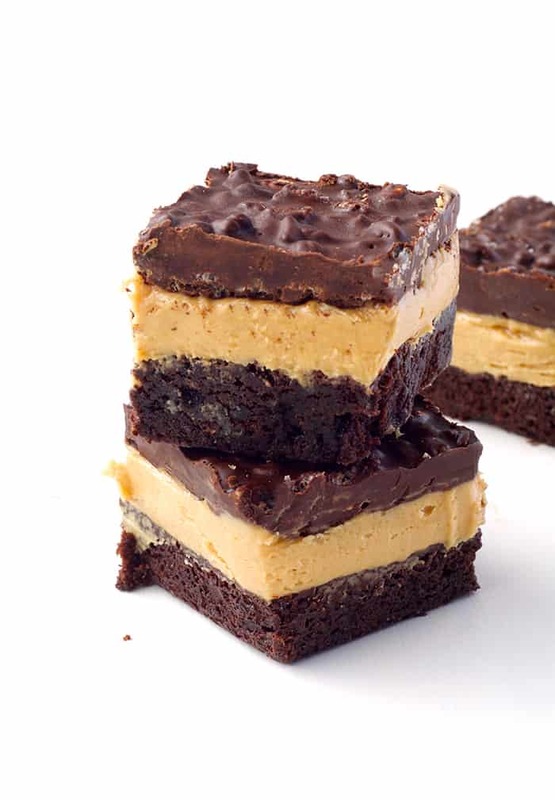 But peanut butter, chocolate AND brownies? This treat just went next level friends. BUT it is still so easy to throw together. The brownie is a simple mix and stir recipe. It is made with just cocoa so you can save the real chocolate for that crispy, crunchy topping. Once it has baked and cool, it’s time for the three ingredient peanut butter filling. 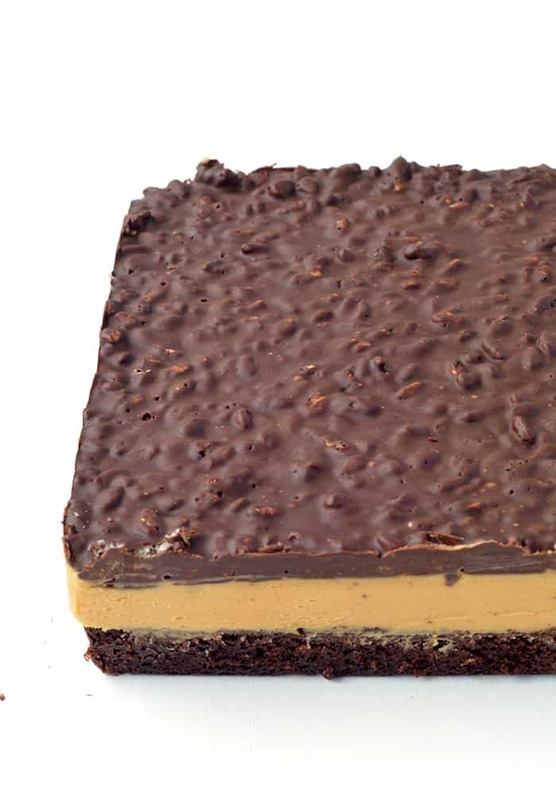 Then, finally the crunchy choc top layer which is just two ingredients – chocolate and Rice Krispies. The perfect match. 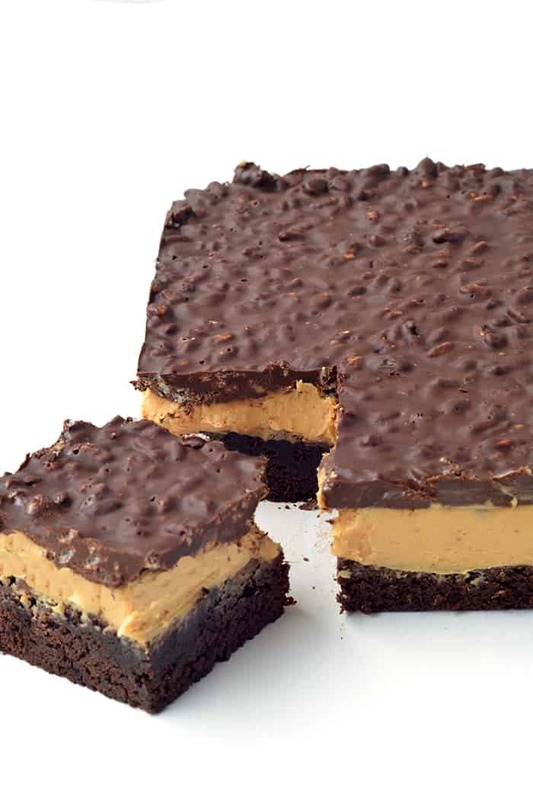 Altogether, this brownie bar is chewy and soft , sweet and salty and completely irresistible. 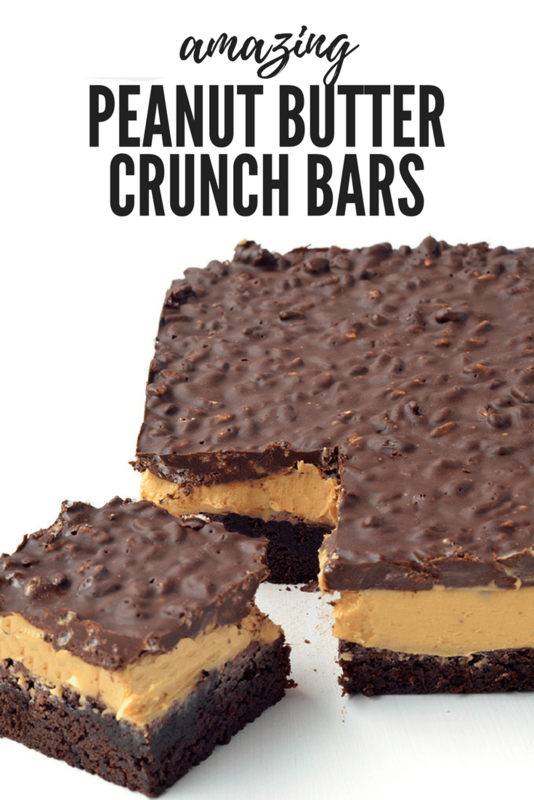 If you love your peanut butter treats, like peanut butter cups, you will LOVE this. 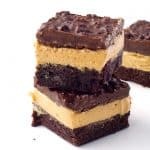 Peanut Butter Chocolate Brownie Crunch Bars with a cocoa brownie base, a creamy peanut butter filling and a crispy chocolate topping made with Rice Bubbles. Melt the chocolate in the microwave until smooth. 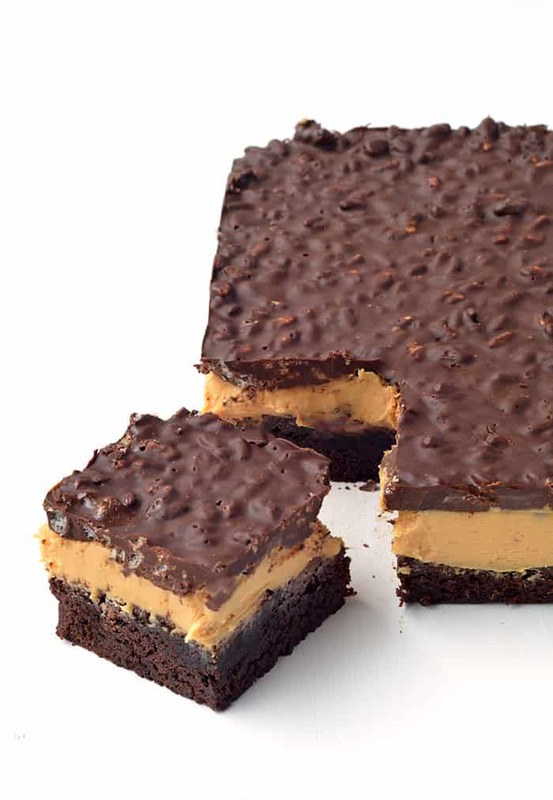 Quickly stir through the rice cereal, then pour the chocolate mixture on top of the peanut butter filling and spread out as best you can. Place in the fridge for at least 2 hours or until firm. These look amazing. Any idea how long they would be good for? Would love to make them a few days in advance but want to make sure they still taste 10/10. Hi Ashley! These bars keep quite well for a few days ☺️ Just store them in the fridge in an airtight container. Do you think it would work if I substituted the Rice Krispies with peanuts? Thanks! Absolutely Candace! That would be delicious! Holler! 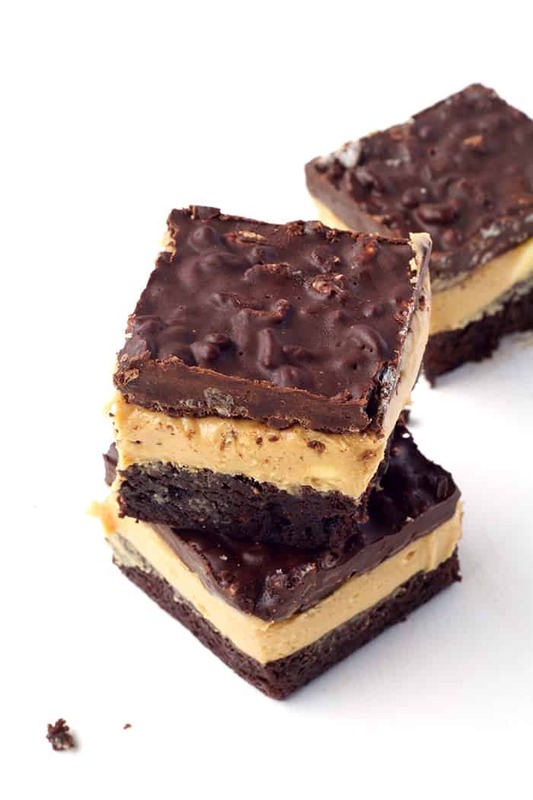 Your peanut butter & chocolate recipes are always excellent! My husband is a big fan of rice crispies but I don’t really care for it much. But this combination is genuis. chocolate and peanut butter for me and rice crispies for him. Win Win! Jenny, you will both love this! And after you have that crunchy chocolate topping, I think you might even come round to rice krispies!